Well actually I could, this is my blog and all, but that would only precipitate a flurry of comments. Actually not a bad idea...LOL...but no...maybe my giving my reasons will elicit even more comments...ah hell...I am going to tell yo whether you want to hear it or not. Well, here goes. The south shore of Long Island is along the Atlantic Ocean. It is right in the path of a warm water flow of the Atlantic. Don't believe me? Well here is a map! OK, so you will say, "Hey, so is the whole east coast of the US!" To that I answer, "Yes, but the south shore of Long Island, and it's beaches are in an East-West direction whereas the beaches of Florida, the Carolina's et al up the eastern seaboard are North-South beaches." The currents and the wave activity come right at Long Island. This results in a finer grain of sand on the beaches and some intense wave action for surfing or body-surfing. The water is also warmer for a longer time than the beaches of New Jersey. Took me a while to get to my submission for the Roger's contest, didn't it? This was taken at Smith Point Beach, which is located on the Eastern portion of Fire Island. All I did was make it gray scale and get rid of the tire marks from the Park Ranger's Jeep. On this map, you can find Smith Point State Beach, by locating Mastic Beach - center of the Island. 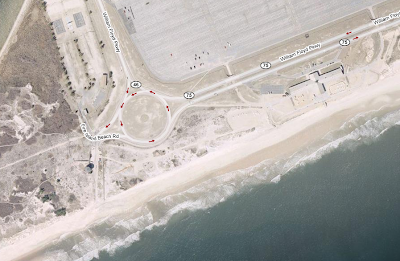 And finally, from google maps....a closer look at this great beach. 1969 - 1971 Long Island...my friends and I used to use fake ID to get into the club where this band used to perform...well that is until the night my buddy used the same ID as I had used! Made it tough getting past the mountain of a doorman they had. This is The Illusion. "Did You See Her Eyes". You can read more about them HERE. ooh - fake ID... reminds me of the time my wee sis nicked my provisional driving license to give to a friend who was caught... Police were involved. Nice! Well you certainly sold the beach to me. Love the Smith Point Beach picture! Nice job Vin. You used a fake ID? I am shocked. Shocked I say!! Cheers!! The Atlantic has the best beaches, from the Island south. Oh how I miss the ocean. Although I have a preference for the west coast, I'd certainly entertain visiting Long Island! And the spider tree? Beautiful! Interesting bit of trivia. I didn't know about the warm current affecting the water that far north. My only disagreement with your "best beaches" claim is that out here we get some pretty increadible sunsets over the Pacific. That puts it over the top for me. I remember my first trip to the east coast many years ago. Thought it was pretty cool to see the sun rise over the water for a change of perspective. Nice picture Mr. Bond. I love gray scale. And sepia tint for that matter. I love the beaches on Long Island..that fine sand is just delish!! I have friends and family on the North Fork. Love it there!! 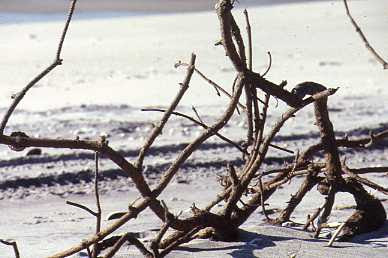 Your spider tree looks as though it could start running down the beach - cool shot. I had fake ID but never had to use it. I looked 25 when I was 13. At the time I thought that was cool but Oh Man did it get me into trouble!! STARRLIGHT: LOL...now I never thought of fake ID for a concert! JAY: Well you had a 50/50 chance! No worries on the link, just wanted to point it out...your seat here on The Couch is secure! Um, I've been to Long Island but never to a beach there. I do lead a sheltered life. I love the desolate feel your photo of the spider tree evokes. Nice magic job on the photo, Vin. My FIL doesn't believe that the Pacific is much colder than the Atlantic. I told him that when we go to San Diego, we don't go in the water because it's too cold. He told me, "Well the Pacific is much warmer than the Atlantic; why wouldn't you go in?" I asked him what he'd been smoking! Living in WP, that surf is waaaaaaaaay warmer than Coronado's water. Lol, fake id, brings back good and well shall we say not so good memories, oh and love the spider tree, very cool. GAH! No spiders in trees! I'm not much of a beach expert, but you make a good case. And I'm glad there weren't actually any spiders in this post. Vin awesome editing job and great photo! 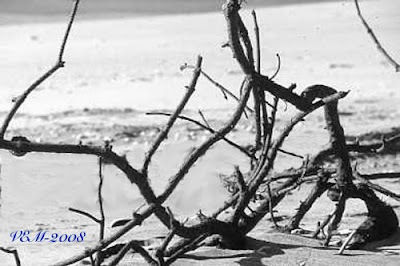 There is just something about limbs that have washed up onto shore that gives them a feeling like no other. Very cool indeed! I love the black and white effect. I LOVE the picture, especially gray scale I think. I'm still into the 'loving the naked trees' phase, and this fits right in there. SONGBIRD: Well it was only 18 then for me also, but I was 16!